The P16-M’s simple user interface makes it easy for even non-techies to dial-in the perfect monitor mix. For example, let’s say the electric guitar is too loud in the lead vocalist’s mix; they simply press the appropriate channel button (the one labeled E. GTR) and turn the Volume control to lower the guitar level in their mix. They can also adjust Pan (left to right mix), EQ (Bass, Mid with sweepable Freq control and Treble), and much more. All of these adjustments can be made without affecting anyone else’s personal mix. 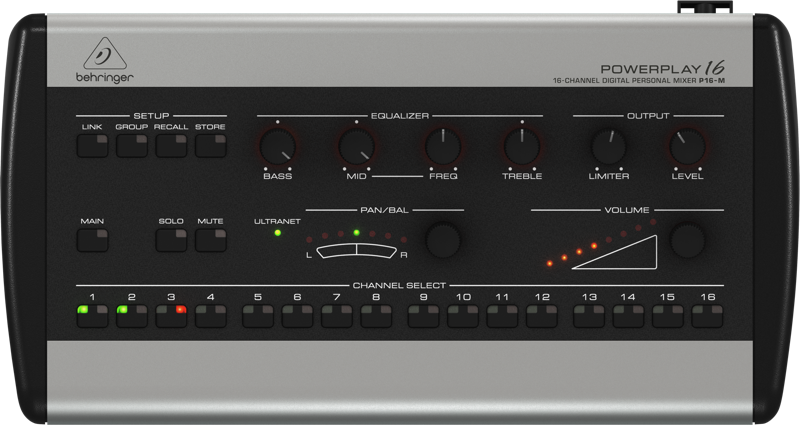 A basic installation consists of one P16-I Input Module, which connects to the main mixing console, and up to six P16-M Personal Mixers, creating a system big enough to equip a typical recording studio, a small to medium-sized band, or a worship team. You’ll also need a few standard audio and CAT5 cables. The optional P16- MB mounting bracket allows the P16-M Digital Personal Mixer to be attached to any standard microphone, music or drum stand. The system can easily be expanded via the P16-D Digital ULTRANET Distributor, six of which can be combined to drive up to forty-eight P16-M Personal Mixers.